Promotech combines human know-how and automated precision. 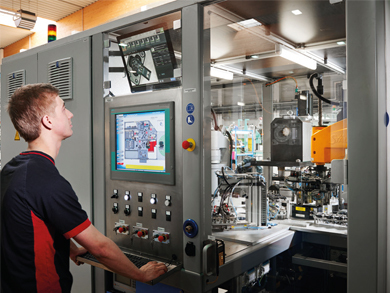 On fully automated production lines we manufacture complex plug connectors and sensor housings with the help of plastic injection molding, metal, punching and bending technologies. From the basic concept to the high-precision serial production we are the special partner for our customers who combines the parameters “ultimate precision” with “efficient, highly-automated production”. Together with our customers we develop and manufacture components for highest demands and offer all the capacities required for this purpose unified under one roof – everything from a single source. 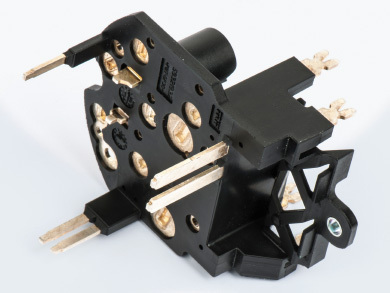 Control element with up to 10 contacts with automated bending, placement, molding and testing – guaranteed quality through 100% quality control in the production process and zero-defect strategy. We dispose of the most modern production lines in Europe which enable us to translate complex requirements into high-precision results. This is something we can guarantee, because we produce or carry out, respectively, any and all required parts and necessary steps – all by ourselves and all from a single source and with a high degree of automatization. Our services comprise engineering, mold and tool making, punching and injection molding techniques (with focus on insert molding technology) as well as automated assembly technology. We understand the demands of our customers and contribute our manufacturing expertise to the production process. Promotech is the perfect partner for the leading automobile suppliers when it comes to translating innovative ideas from the scratch to top-quality serial production with zero-defect strategy. You are looking for a professional challenge? You are characterized by commitment, dedication and team spirit? If so, we would like to get to know you! We offer you an interesting range of tasks in our internationally operating enterprise, performance-related remuneration and attractive additional services, and – above all – a friendly, familiar working environment and a motivated and committed team to work with. We are proud of our apprentices – and proud of the fact that they proceed and develop together with us. 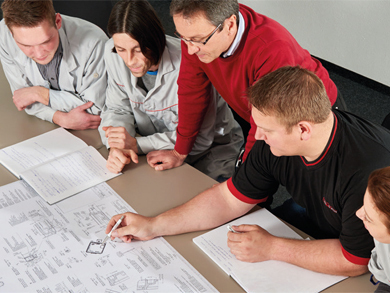 As an approved apprentice trainer of our region we foster young talents and train skilled workers in the fields of mechatronics, plastics, metal and production technology. Our INEO Award as well as the certification as a “State Approved Training Company” provide evidence thereof. And we do offer future perspectives: Having accomplished post-training practical employment for a couple of years in the apprenticed field, our employees are offered the possibility of transferring to other departments or undertaking further trainings at Promotech. We support you in developing your skills in the best possible way and offer you best career opportunities – many of our current top-level employees have achieved management positions in our company after having served their apprenticeship at Promotech. Be part of our team – we look forward to your application!